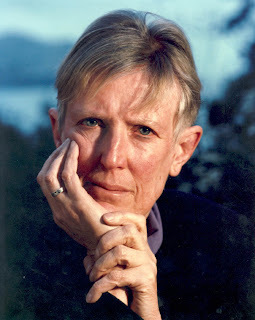 Margaret Mahy, one of New Zealand's greatest-ever writers,(I put her up there with Katherine Mansfield), died in Christchurch this afternoon after a brief illness. Margaret Mahy is a former Children's Librarian at Christchurch City Libraries and is one of the world's best and most famous children's authors. Margaret Mahy was born in Whakatane in 1936, and wrote her first story at the age of seven. After graduating from Auckland University College and Canterbury University College, in 1955, with a BA, Margaret Mahy then attended the New Zealand Library School in Wellington, received her Librarian's diploma, and then went to work for the Petone Public Library. In 1967 she worked for the School Library Service in Christchurch. During this time she had stories published in the New Zealand School Journal. 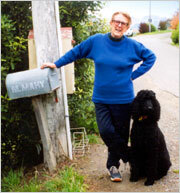 Margaret Mahy's first book to be published was A Lion in the Meadow in 1969. In 1976 Margaret Mahy was appointed Children's Librarian at Canterbury Public Library. In 1980 she became a fulltime writer and has gone on to win numerous awards for her books, and honours for her contribution to New Zealand and children's literature. And from the New Zealand Book Council website. Farewell Margaret, I salute you, it has been both an honour and privilege to know you. One little story from a visit I made to an American library back in the late 1980's. I was in the public library in the small Connecticut town of Westport with the pre-school son of a friend. At one stage I took a photograph of him sitting looking at a picture book and was immediately reprimanded by the librarian who tersely asked "had I not seen the sign saying no photography?". I apologised and upon noticing my accent she asked me where I was from. New Zealand I said. Oh my she said I don't suppose you know Margaret Mahy? Indeed I do I said, I know Margaret very well. Oh in that case she said please feel free to take as many photographs as you like! She then gave me a guided tour of the library which included two large full colour posters featuring Margaret and her books. And she talked endlessly and enthusiastically about Margaret's genius and about listening her speak at a librarian's conference.And then insisted on making me a cup of coffee. Such was Margaret's reputation and influence. Thank you Graham for a fine tribute to Margaret. She will continue to light up our world. Margaret was a treasure, her books will continue to be so. Oh bugger. She was just around the road from me at Governor's Bay ... we've lost one of the great writers and personalities in New Zealand. Oh no, what a shock! Dear Margaret. She leaves a legacy that will be treasured by generations to come, and one unlikely to be matched. Rest in peace, Margaret. She was a remarkable woman and writer who has brought magic and joy to so many children and adults, and whose work will inspire generations to come. She inspired me to write ever since I was a child. Thank you for this tribute, her books will continue to keep her memory bright. I am saddened that Margaret has died. Yes, her work lives on but her inimitable wonderful self is gone...she was one of the very few ANZ writers I both liked as a person and admired for her extraordinary work. Reading life - ordinary life here in our islands & elsewhere- is lessened by her death. A true kiwi icon, that made the lives of many New Zealand children and adults brighter with her fantastic stories. Her stories will be forever in my home. The Changeover was the first book I read as a teenager which really meant something to me. Very sad news. Go well, Margaret Mahy. We hope you are romping with the lion in the meadow ... Rest in Peace. So thankful we showed her our appreciation of the immensity of her gift to literature and to the children of New Zealand and the world - while she was alive. What a loss though, it will take a lot to get used to. Margaret's father built bridges. So did she, with words. Dear Margaret, I hope your journey across that final bridge was full of wonder. We will miss you forever from our side. Thanks all, for your kind heartfelt words. We are huddled together as a family, a little overwhelmed and shocked, but heartened by your goodwill and generosity. We'll miss her. What a loss. I am grateful for all she's written - and all the books of hers I own - from an extremely tatty Lion in the Meadow (signed) to a beautiful illustrated copy of her poems. May she rest in peace. What a shock to hear of Margaret's death. She spoke to a group of Children's Librarians when I worked in London, it was so good to hear her voice and see the regards in which she was held. I had looked forward to many more wonderful stories from her. Every story long or short, for preschooler's or young adults was a joy, resounding with our language and our world view. Her imagination was informed by our wonderful landscape and enriched by the heritage of both our cultures. Her language was rich in nuance and colour and her characters were acutely observed. She was one of New Zealand's finest writers and a wonderful woman. I have been reading Margaret's books to school children for many ,many years.Her words never fail to light up a room.Thank-you for that wonderful gift.What a legacy she has left. I know our children will always remember Margaret as one of their favourite authors....and, how poignant that in my 36 years of teaching, her books still have a significant role in my classroom. One of my greatest heroes. Her stories were iridescent, one of my favourite ways to escape my own childhood stresses and griefs. I am so sorry and sad to hear she has gone. Goodbye to a wonderful person. A wonderful, kind, generous, hilarious,cheeky, uplifting, irreverent, gifted, supportive, extra-ordinary person. I count it my absolute pleasure to have shared a table and broken bread with her. a little piece of nz is gone forever, and we are irrevocably changed. we will miss and remember you, margaret, as will our kids, and theirs too. She was and will always be one of New Zealand's greatest writers. I remember interviewing her once and she said she'd always wanted to learn to tapdance. She did. She tapdanced through words. I admire her work and love it more than words can say. I am so saddened at the loss of Margaret Mahy. She was a brilliant, funny, inspired author and friend. I was so lucky to have had the pleasure of hearing her "perform" some of her picture books and am honored to have edited and published the McElderry Books edition of THE MAGICIAN OF HOAD, the novel on which she was working for 20 years and a masterpiece. Long may her books continue to awe and inspire us. Margaret Mahy was a legend amongst the men and women prisoners I worked with in New Zealnd. Reading to them and introducing them to a book by you Margaret was in many cases,to open a whole new world of fun,imagination and joy,a joy that many had never had, but a joy they now pass on to their children. I am now in Canada Margaret, where you are already a legend, and will continue to be so.Most days i read a Margaret Mahy story to those who are away from their family for a while, who if asked by their children where did they put something of course the answer will be "Down The Back of The Chair! "Rest in peace Margaret Mahy, legend. The wind between the stars will be carrying Margaret like a queen in triumph. Go well, Margaret I feel honoured to have met you. Two wonderfully colourful women, Dorothy Butler and Margaret Mahy personally encouraged me in my author career. They led me to the greatest places - over the rainbows and into the clouds and high towers of children's picture books. I'm ever more involved with this in the 'iPad' age. I'm indebted. How many writers are viewed with the admiration, love and affection that Margaret has inspired - and how many have a statue of a lion erected in their honour? I hope the Lion in the Meadow outside Whakatane Public Library is garlanded with flowers today. She was a warm-hearted and generous woman. Other writers must now take up the mantle and extend the fine tradition she has so wonderfully created and upheld! Margaret was a clear-eyed white witch when my son Luc was an equally clear-eyed toddler. At the Christmas party which she regularly hosted for the NZSA, he would bounce on the trampoline in her tumble-down-the-hill garden, shouting instructions to watch. So Margaret (also) watched. She was watchful in a way few of us manage to be. Luc still has several of her first editions, inscribed with hand-drawn lions, crocodiles etc. And, two decades on, I can still see her sketching. For many years I have missed that younger, healthy Margaret. I will continue to miss her. A warm and generous person gone, a national treasure lost - and yet her unique voice will always be with us. It is warming to my writer's heart to see so many of you here, gathering around the empty couch, still warm, where she held court in her hat of many colours. My fondest memories of Margaret are of the many ways she so generously encouraged all writers, supported them, bought their books, and I my case on one occasion directing *her* fans to turn around and meet me - sitting five feet away with none. A quick hello to those I have met in life, and so too the the names here I recognise. And what to take and keep of MM? Her words, the memories, and and her en-courage-ment. What an immense journey done. More remarkable than fiction. I think you must add Essie Summers as an ambassador of New Zealand literature to the world. While she wrote genre fiction, she had millions of fans throughout the world, many of whom long to visit the country she loved so much and described so well. I certainly have read and own more of her books than those of Mahy or Mansfield, although I appreciate them too. After I discovered her books in the US many years ago I would buy everything I found, and have "saved" a few YA novels that I haven't yet read. "The Tricksters" is one of my favorites. She was unique, and is not known in the States as well as she should be, I've always felt. If I could write one sentence as succinctly as any one sentence from one of Margaret's many, many books I would be a happy man. I honour Margaret's memory by wearing a wig every time I read to children. Her legacy will live on ... well after she has gone. We met her walking her dog (the original of "Dashing Dog") around Governor's Bay one windy day. A charming lady. She will not be forgotten.